With graduation on the horizon for many Pi Gamma Mu members, don't forget to order your honor cords. They are royal-blue and white twisted nylon cords with royal-blue tassels. To get your graduation cords, send a check or money order for $17.95 (which includes postage and handling) to the Pi Gamma Mu headquarters at 1001 Millington, Suite B, Winfield, KS 67156, or phone headquarters (620-221-3128) and give us your credit-card number; we will put them in the mail right away. The Illinois Kappa Chapter at Dominican University (formerly Rosary College) in River Forest, Ill., has been in existence since 1952. 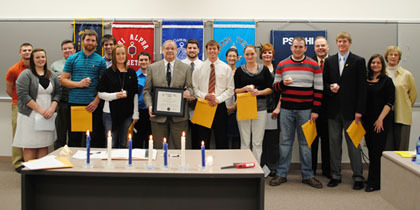 Our Pi Gamma Mu chapter is one of the largest and oldest active honor societies on campus. I have been the faculty moderator since 1983. Pi Gamma Mu's international constitution defines our mission this way: "The mission of Pi Gamma Mu is to encourage and promote excellence in the social sciences and to uphold the ideals of scholarship and service." If Pi Gamma Mu is to "promote excellence," presumably our honor society is obligated to live up to the standard of excellence as it generates membership services and products. The American Geographical Society (AGS) needs your help in a matter of vital importance. The society is conducting a nationwide survey of public attitudes toward geography and knowledge about geography. This survey is a facet of a major study funded by the National Science Foundation. At Pace University, the New York Tau chapter held its initiation ceremony. Shown are the seven candles which symbolize the seven ideals of Pi Gamma Mu. The International Social Science Review, the peer-reviewed journal of Pi Gamma Mu, published semi-annually, invites applications for the volunteer position of book-review editor. Duties include receiving and distributing for review publications in the social sciences covering the disciplines of history, political science, sociology, anthropology, economics, international relations, criminal justice, social work, psychology, social philosophy, history of education, and human/cultural geography. The book-review editor asks publishers to send to the journal books for review that would be of interest to the readership of the ISSR. The Institute for Cultural Diplomacy is currently accepting applications for the events outlined here. The programs will bring together governmental and diplomatic officials, civil-society practitioners, private-sector representatives, journalists, young professionals, students and scholars, and other interested stakeholders from across the world for a program of lectures, workshops, panel and group discussions, and social and cultural activities featuring leading figures from the fields of politics, the arts, academia, the communications media, and business. Our congratulations go out to Dr. Allison G.S. Knox, the chapter sponsor at American Military University / American Public University. She has been promoted from adjunct to full-time teaching status. At the University of Arkansas – Little Rock (UALR), Dr. David Briscoe, sociology professor and sponsor of the newly chartered Arkansas Zeta chapter, was selected to receive the Best of UALR's Professors award. Dr. Clara Small, international second vice president of Pi Gamma Mu and chapter sponsor of the Maryland Gamma chapter at Salisbury University, was a lecturer as part of the Adventures in Ideas humanities seminar series. 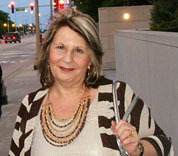 Dr. Small teaches classes on civil rights, and African-American, U.S., world, and oral history at the university. The series of lectures looked back on the Civil War from current perspectives during its 150th anniversary. Barack Obama set upon his journey for the presidency in 2008 and “change” was his slogan. To many people in the United States, Obama represented “hope” for change in a system of politics that seemingly had become contradictory to the very democratic principles the country was founded on. Common people around the country of all races and ethnicities were so desperate for change that electing the first “Black” president became a reality by a landslide margin. Jack Norris joined Pi Gamma Mu in 1958 at the Connecticut Alpha chapter at Trinity College. 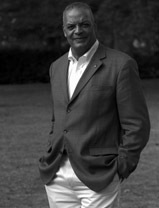 He received his M.B.A. degree from American University in 1964. In 2009, finding himself unemployed, Mr. Norris decided to go back to college, so he enrolled in a local community college. He stated, “Senior-citizen centers depressed me!" While he was taking a civil-rights course, his professor, Dr. Robert Young, encouraged him to publish three articles he had written many years ago. HAVE YOU VISITED PI GAMMA MU'S WEB SITE LATELY? If you haven't visited Pi Gamma Mu's Web site lately, you might be surprised to discover the many new features that are available for members, prospective members, and chapter officers. Two new Web pages contain descriptions of Pi Gamma Mu's benefits and services to familiarize prospective chapter sponsors and prospective student members, respectively, with what our honor society is all about. Those pages are designed to encourage the development of new chapters. If you know of professors or students at colleges that don't have chapters who you think might be willing to help start a chapter, please refer them to those Web pages. Two other new Web pages present ideas about programs and projects for chapter officers and tips and resources for chapter sponsors. Please look around our Web site: You might find some content that will be useful to you. Headquarters is selling royal-blue Pi Gamma Mu sweatshirts in sizes M, L, XL, and XXL for $35. We have navy-blue polo shirts, embroidered with the Pi Gamma Mu key design in white, which are always a popular item. We have them in sizes M, L, XL, and XXL for $35. You can order your honor cords any time during the year. They can be worn at graduation, they can be draped around your Pi Gamma Mu membership certificate on the wall, or you can be creative--but be sure to order yours. There is an order form on the merchandise page at www.pigammamu.org. You can also call headquarters and purchase these items with a credit card and they will be mailed to you immediately. If you would like more items with the Pi Gamma Mu logo, check out the selection from CafePress Storefront. To frame your certificate, Church Hill Classics has many options to choose from.